Where do I use my Wild and Gorgeous voucher code? A Wild and Gorgeous promo code will help to save money on your order simply by entering it when prompted at checkout. When used these discount codes will show an instant reduction and you will only need to pay the lower total. Past promotional codes include 20% extra saving on all Sale items, free delivery to your home and 20% off dresses, so if you find one of these at NetVoucherCodes, they are well worth using on your basket total. Codes are always time sensitive, so be sure to use one before the displayed expiry date, to avoid the disappointment of missing out. 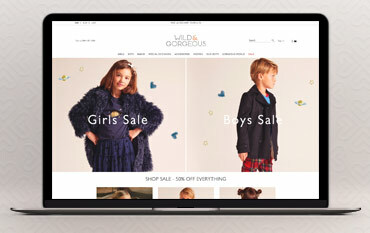 The sale section on the Wild and Gorgeous website offers big reductions on the fabulous children’s clothing ranges. You will find great savings on both girls and boys clothing, as well as babies clothing for both boys and girls. Whether you are looking for a complete outfit for your little one for a special occasion or you are just looking for a few new additions to their wardrobe, you will find a wide choice of tops, dresses, trousers, knitwear, t-shirts, shirts, jackets, footwear and more, each at a fraction of the full price. At certain time throughout the year, Wild and Gorgeous will run a much bigger sale to make way for the new season’s stock and this is where the real bargains lie, perhaps sign up to receive their newsletter, so you will receive notifications when one of the big sales goes live and you don’t miss out. The collection of girl’s dresses available is impressive, children always seem to be coming home from school with an invite for a party, so a Wild and Gorgeous dress is a good investment to become their go-to party dress. From beautiful lightweight summer dresses through to formal flower girl dresses, this shop has it all. Whether you and your little one prefer bright coloured patterned dresses or more understated pastel colours, you’ll find everything here, from a dress for everyday wear to dresses for parties and even a wedding. Their flower girl range has become increasingly sought after, with a good mix of traditional flower girl dresses alongside more modern versions too. Wild and Gorgeous has evolved from the much loved ‘ilovegorgeous’ brand, offering design-led fashion for wild boys and gorgeous girls. From Baby wear through to 15 years, Wild and Gorgeous has an outfit that all little ladies and little men will want to wear because every princess deserves to look gorgeous and every boy 'cool'. Save money on the beautiful children's clothing by making use of one of our Wild and Gorgeous discount codes. Delivering worldwide and live on all Social Media, take a peek at the kid's clothes on offer. we are certain you will fall in love with many of the pieces.